Do you want specific strategies to be a successful artist? It’s all about improving your skills. Art workshops can provide the boost you might need for your creativity. Artist Eldar Babazadeh has shared some professional secrets with art lovers during a recent workshop. 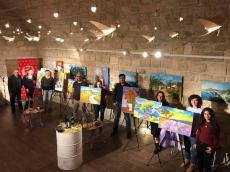 The master class by artist was organized in Art Tower Gallery, Trend Life reported. Babazadeh`s works are distinguished by bright colors. All paintings are created with great skill inherent to those artists, whose creative path is marked not only by natural talent, but the eternal creative search. Thus, meeting with artist aroused great interest among art lovers and amateur artists. During the event, participants created vivid works, spilling out their emotions on the canvas. If you missed the workshop with Babazadeh, don’t be disappointed. Similar master classes will be organized once a month.